In this article, we will outline and review 20 of the best Customer Success Software, enabling you to make the right decision based on your organisation’s needs. Customer Success Software is software that offers a unified, 360 degree view of all your customer data pulled and combined from third party applications such as email, CRM services, live chat, customer support ticket, and more. Top features of customer success software include but are not limited to customer engagement analytics, product usage tracking, customer health scoring, complete customer profiles, workflow automation and real time insights. Customer success software helps businesses proactively spot customers that need attention before they drop off. This type of software can help you decrease customer churn rate, increase customer engagement and retention, identify upsell and cross-sell opportunities, and discover customer advocates that help boost revenue. Ultimately, by proactively understanding and helping customers, it will help businesses ensure their customers achieve the desired outcomes they want. Gainsight is one of the best and highly rated customer success software in the industry. The platform offers a broad range of capabilities for customer success management that includes providing insights, collecting feedback, engaging customers, transforming customer success. One of its top features is Customer Health Scores that measures and gives each customer a specific score based on the overall satisfaction of a customer. The platform is also equipped with machine learning that is able to learn and enhance its predictions on customers based on its growing knowledge of customers and their previous behavior. ClientSuccess is a customer success software that helps you retain and grow your existing customer base. The platform is known for its clean, easy to use interface that is well-favored by current users. Like Gainsight, its trademarked ClientSuccess Success Score offers customer-specific, detailed scores on customers’ overall health, product usage, sentiment, advocacy, engagement and more. However, its reporting feature is limited and third party application integrations could be better. ChurnZero is a real-time customer success software that helps subscription businesses prevent and lower potential customer churn and increase customer success. The platform seamlessly integrates with Salesforce, HubSpot, and more CRM services, and automatically transfer customer data to its platform. Besides, it enables you to easily create and configure a custom ChurnScore that measures the risks of potential customer churn. Another great feature of the platform is its ability to provide a detailed view of each customer journey and a map that shows where they are. Totango helps enterprises increase customer engagement and grow their customer bases with its customer success platform. One of its top features is its easy-to-use account management that lets you automate and create workflows for business processes such as customer segmentation and revenue forecast. Its customer relationship hierarchy feature also makes it easier for businesses with multiple product lines and brands by visually showing customer relationship hierarchies across different brands and product lines. This allows customer success teams to offer personalised communication to customers across different segmentations and hierarchies. UserIQ is a customer success software that focuses on customer onboarding, user adoption, user engagement and feedback for SaaS (Software-as-a-Service) companies. The platform gauges customer sentiment and behavior based on user login, adoption, and usage data as well as account level data. It also assists companies in offering guided onboarding tours to users to accelerate user adoption and in collecting user feedback through surveys. Like most platforms, it also provides customer-specific health score, proactive event notifications, and prompts customer advocacy. Natero is a machine-learning powered, data-driven customer success software that is specially made for B2B SaaS companies. It lets you manage your customer journey, gain customer success insights, and retain and expand your customer base. One of its well-favored features among users is its Customer 360 that shows all your customers and all of their data and health scores at a glance. Additionally its intelligent health scoring lets you see your customers’ scores based on in-app usage, support tickets, customer success management score, Net Promoter Score (NPS) and more. However, its reporting functionality and customisation could be limited. AppsforOps Timeline describes itself as a ‘game changing customer success software platform’. Its core feature Timeline lets you view a timeline of all your customer activities right in your Outlook or Gmail inbox. It loads automatically when you select or enter an email address, and all the activities loaded include but not limited to emails, calls, tasks, notes, and all the data from your existing systems such as sales, marketing, and customer support. Besides, its Company View will show you a timeline for any contacts that share the domain name of the email address selected or entered. The main advantage of this platform is its ability to show you the whole picture on any specific customer and help you act on what matters most. Amity markets itself as ‘the flexible customer success platform’ that adapts to your business. The platform supports plenty third party app integrations, and with that, offers a unified view of all your customers and their data from CRM, support, billing, email, marketing, and usage and outcome data. It also comes with automation — SmartPlaybooks — that automates repetitive, manual, information-driven processes. Like most platforms, it also provides customer insights such as health score and engagement, reporting, and collaboration across your organisation. PlanHat is an easy-to-use customer success software with a clean and user-friendly interface. Like most platforms, it puts all of your customer data and interactions in one place and offers customer insights and health scoring. However, it provides a powerful onboarding product that lets you build playbook and workflow, revenue management for subscription businesses, and a virtual workspace for customer success team collaboration. PlanHat is also known in the industry for ease of use and fast onboarding process. Bolstra is another customer success software that helps companies achieve complete visibility of customer activity and health and tackle customer churn. The platform also helps companies manage customer growth and predict revenue more accurately. If your organisation is big, great thing is it enables easy collaboration across various department. However, one of the major downside of this platform is its lack of survey management, which is very crucial to customer success management. 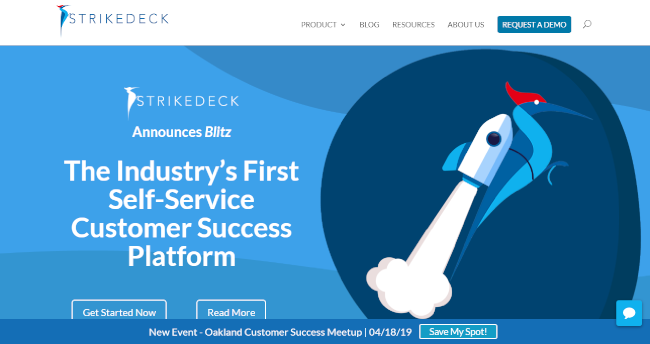 Strikedeck is one of the leading self-service customer success platforms that is powered by AI and machine learning. With its central dashboard Customer 360, you can see your entire customer base with real time analytics at a glance. It also automatically identifies churn risks as well as upselling and cross-selling candidates using predictive analytics and machine learning so that you can immediately act on them. Another awesome feature of Strikedeck is that it brings and combines all the data of each and every customer of yours, from your CRM to email and social media to billing, to compute a live customer happiness score. However, the learning curve for Strikedeck might be steep if you are not familiar with customer success software. Unlike most customer success platforms, Client Share is built and designed for buyers and suppliers. As suppliers, you can use the platform to manage all key accounts in one place, analyse customer experience and happiness score, and reduce churn rates and boost revenue. Similarly, as buyers, you can use manage all of your key suppliers in one place and analyse and improve your relationships with them and their overall health scores. Besides, there is also a private, collaborative community for buyers and suppliers to interact and engage with one another. However, the pricing of its plans might be steep compared to others, starting at £150 per month. Described itself as ‘your B2B customer success engine’, STAMP is a powerful B2B customer success platform that features two primary dashboards (one is client-oriented and the other is for internal use). STAMP produces a dashboard for every of your client, visualising detailing overall perspective and customer sentiment with key indicators such as Ease of Doing Business and Net Promoter, category scorecard that shows how your company is meeting the needs of your customers in key categories, and more. Internally, you get access to a dashboard that shows performances of your account managers and know who is getting ahead or lagging behind. You can even use STAMP to benchmark yourself against your peers or competitors. However, you can expect hefty price tags for such a feature-rich, advanced platform. Salesmachine described itself as a customer success orchestration platform that is trusted by Instapage, Zenhub, and mention. It offers a comprehensive health scoring system that tells you which customers are at risk and which leads are ready to convert. Besides, it lets you see a holistic view of all of your customers in one place along with indicators such as NPS, Pulse, Lifecycle Stage, and Overall Usage. In order to free up your time so that you can focus on taking real action to enhance customer success, it enables you to integrate popular tools like CRM, emails, support, and product usage, and then automate your workflows. CustomerSuccessBox is a customer success platform that is specialised in B2B Software-as-a-Service and driven by outcomes in three areas: customer adoption, customer retention, upselling. Aside from visually compelling 360 degree view of customers and health monitoring, the platform also tracks customer success and analytics of your customers across five categories: product adoption, financial, service, relationship, and risk. Besides, it also lets you track your milestones and progress on each client from onboarding to retention to upselling. You can also send email campaigns to customers based on pre-defined triggers right from the platform. However, the platform lacks automation for workflows, though it supports plenty of integrations. 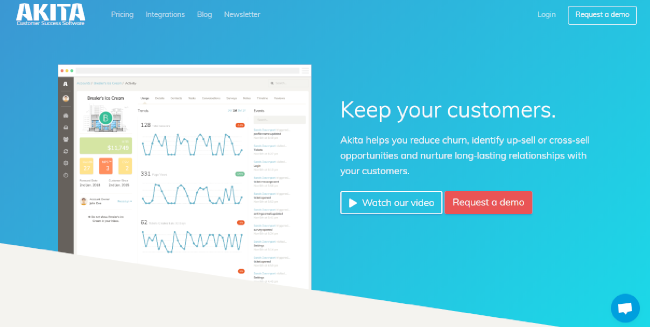 Akita is another customer success software that aims to help you reduce customer churn, boost revenues (by identifying upsell or cross-sell opportunities), and build long term relationships with your customers. It comes with essential features such as account health scoring, customer lifecycle management, customer segmentation, automated playbooks, and usage tracking. In addition, you can integrate Akita with over 100 SaaS tools with one click and enhance your workflow. It also automatically sends actionable alerts driven by data and analytics so that you can take immediate action. However, the major drawback is that it charges higher than other competitors do and each additional user cost $80 per month. 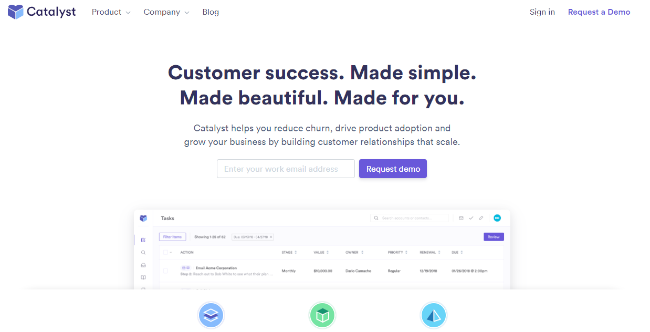 Catalyst is a customer success platform that combines customer analytics and insights and workflow automation to let you maximise customer lifetime value. Its powerful platform consists of 360 degree profiles of all your customers, product usage tracking, a task manager that brings all your works and tools in one place, playbooks, campaigns, and customer segmentation. Interestingly, using its playbooks, you can define conditions and results to help your customers have the journeys in the direction you set. To reduce customer churn and improve customer success, its campaign feature empowers you to use personalisation and targeted templates to automate your drip campaigns. CustomerGauge is customer success software that is focused on Net Promoter and customer retention. It is trusted by renowned, global brands such as DHL, Eventbrite, and Electrolux. It comes with its Monetize Net Promoter that goes beyond measuring customers’ loyalty and feedback; it also provides instant insights into customers for you to act on as well as identifies opportunities to fuel growth. Unlike other customer success software, it provides a Net Promoter Score for employees (eNPS) that helps you reduce employee churn and produce highly-engaged, happy employees, which leads to more happy customers in return. Optimove is science-driven customer retention and success software that gives you proven insights into your customers, empowers you to engage better with your customers, and automate your marketing campaigns with Optibot. Its Single Customer View and 360 degree Customer view keep you updated about your customers in real time with sources from on-site/in-app user activity, third party data, and first party raw data. Furthermore, its predictive micro-segmentation technology allows you to personalise messages, offers, and promotions to customers based on their micro-segments. Plus, you can automate cross-channel campaigns to counter potential churn and increase customer success on its platform. Kilterly is a customer success platform that lets you take control of your customer lifecycle, gain customer insights, and take actions before your customers walk away. Customisable survey is a unique feature of the platform that lets you create and conduct unlimited surveys that measure NPS and client sentiment. It also offers a Customer Churn Dashboard where you can manage and monitor your customer satisfaction and potential churn through insightful data such as client usage score and ticketing score status. To act on the insights and data, you can then utilise its campaign management functionality to create and run effective campaigns and track progresses. However, one of the major limitations of Kilterly is that it does not support a lot of third party integrations, but it does keep on adding more such HubSpot CRM and Zoho CRM. And that’s a wrap. As you can see, with the right customer success software, you can decrease your customer churn rate, improve customer engagement and retention, and expand your customer base. It’s never too late to help your customers attain their desired outcomes and get the superior customer experience they want. And remember to take advantage of the platform to identify upsell and cross-sell opportunities and find your ideal customer advocates.